Mary Foley energizes female entrepreneurs with the clarity, confidence, and tools to attract, engage, and win more clients. She is an author, energizing keynote speaker, business mentor, host of the P.O.W.E.R. Plug Podcast, and a lover of red capes. On today’s episode, we discuss her book Bodacious! Woman: Outrageously in Charge of Your Life and Loving It! Her sense of humor and positivity comes through on every page of – as it does every minute of this podcast! This book isn’t just for women, either. Her stories encapsulate the principles of improvisation and the philosophy of Yes, And (which is especially evident when she shares the story of showing up to work without a pair of pants). 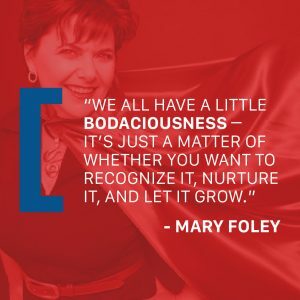 If you look at Mary Foley’s website, you’ll see that being “bodacious” is more than something she uses to brand her content it’s a personal rallying cry. When you read the book, or hear Mary describe her journey towards bodaciousness, you’ll see that she is willing to do something that is very scary for a lot of people: take risks. And if you are, like many of us, wary of taking a risk because you don’t know what’s going to happen, because you might fail, Mary has two words for you – So what? If you try and something doesn’t work out, so what? You might be working off of a bad definition for failure, anyway. Mary’s definition of failure is “simply not trying” and making that internal mindset shift can dramatically change your relationship with risk. 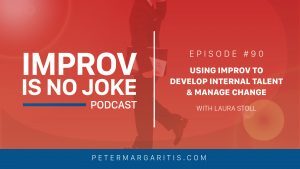 Laura Stoll is the Talent Development Consultant at Ernst & Young, and she has a fascinating perspective on how you can develop top talent within your organization that is influenced by her background in improv. Laura studied at Second City, iO, and ComedySportz Chicago. She even has the distinction of being the only student ever thrown out of previous guest (and current husband) Jay Sukow’s classroom! At EY, Laura strategizes, designs, and consults on large-scale programs designed to improve the value of the internal talent organization, which includes over 8,000 people. Their big focus right now is on the Career Journey. In every organization, people tend to resist change, especially the kind of large-scale change that Laura aims to create. So change management becomes critical, and that’s where the fundamentals of improv can really come into play. 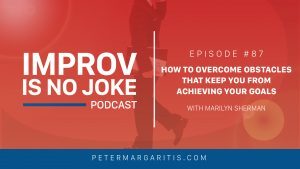 Improv isn’t about making things up––it’s about planning like mad, and then being prepared to throw your script away to meet the needs of the person you are talking to or working with. Learning improvisational skills inspires a more adaptable mindset, and you can’t approach change without that. Possibly the most exciting thing about Laura’s work at EY is that other people see the value of these skills, and the top leaders in the organization are getting excited about improv. There’s simply no way to effectively inspire a change in culture without buy-in from the top, so this is a huge step for a huge organization. And taking that step isn’t optional any more, for any organization. Global markets and whole industries are shifting rapidly – the organizations and individuals who resist change will be left behind. If you want to take your first step today, just practice awareness: When you feel yourself putting up a wall, saying no, or reacting negatively, pause and ask yourself, “How could it work?” It’s basic, but that little tweak will start you on the path to change. Jody Padar, AKA The Radical CPA, is a leader driven by a passion to foster real change in the accounting profession. She represents the next generation of accounting professionals, leading the vanguard for both digital CPAs and future-ready firms. Jody returns to the show to discuss her new book, From Success to Significance: The Radical CPA Guide, which is a practice-proven roadmap to a new business model for CPA firms. If you’re looking to change and you’re not sure how to begin, this lays out the steps of creating change through practical strategies, tools, tips, insights, guest experts, and case studies. So what does the New Firm look like? •Technology is part of the core of the firm and is used to facilitate closer client relationships. •The business model transforms: instead of doing every kind of work for every kind of customer, they’ve niched down. •They productize everything offered, so they don’t track or bill by time and, instead, offer everything they do at a fixed or value price. There’s no question: technology is having a significant impact on CPA firms. So how are our firms going to evolve and transform their business model to react to them, and to innovate with them? 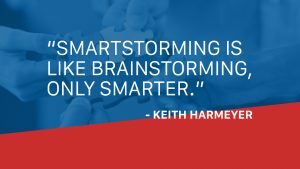 And this transformation isn’t just at the firm or technology level – it’s a total mindset shift that everyone needs to buy into. Everyone in The New Firm needs to be adaptable, forward-thinking, and more than just an accountant. The computers are going to do most of the accounting work, so we need to be better consultants and trusted business advisors. We need to be Radical CPAs. Marilyn Sherman is a speaker and author who has spent years motivating and inspiring audiences to get out of their comfort zone and get a front-row seat in life, and this is the perfect time of the year to check in with her because she has tips and techniques anyone can use to stay focused on their goals (and New Year’s resolutions). It’s the end of January, so some of you may have broken your resolutions already – and that’s okay! Listen to the entire episode, apply Marilyn’s tips, and then you’ll be able to resurrect those resolutions for the remainder of the year. Marilyn wrote this book because even successful people tend to sabotage their own success, in some area of their life. However, we can patch up those holes in our bucket list (or our resolutions) with Marilyn’s tips and techniques. Marilyn suggests creating a bucket list if you don’t have one already because it represents your hope for the future; it’s a glorified list of goals. Then, if there is one recurring thing that you can’t cross off of your list, you have identified a hole to fill. Everyone needs an “Anger Buddy” and an “Anger Sack.” Everyone has a bad day sometimes, but unfortunately, we can end up blowing up or snapping at someone who doesn’t deserve it due to the accumulation of many smaller things over time (which is unproductive). You can avoid this ever happening again if you envision an anger sack that fills up when negative things happen. When you feel that it is full, have a chat with your anger buddy, often a significant other, who you have trained to let you vent; you don’t need to add solutions to an overflowing anger sack.